Miami is one city with the most entertaining, fun activities that you can engage in. The exotic beaches and the night clubs bring life to the city. When you choose our charter bus Miami services you will get to experience Miami in the most stylish way. Our charter bus Miami, FL services is reliable and they are unique. If you want to enjoy the best of the city, you need a reliable service and we are the people to offer you that service. Give us a call (954) 828-0219! Miami is a big city and traffic is a normal thing. However, if you want to be comfortable you need to choose our bus charter Miami. We focus on offering you unique charter bus rental and party bus Miami services that you can choose from. 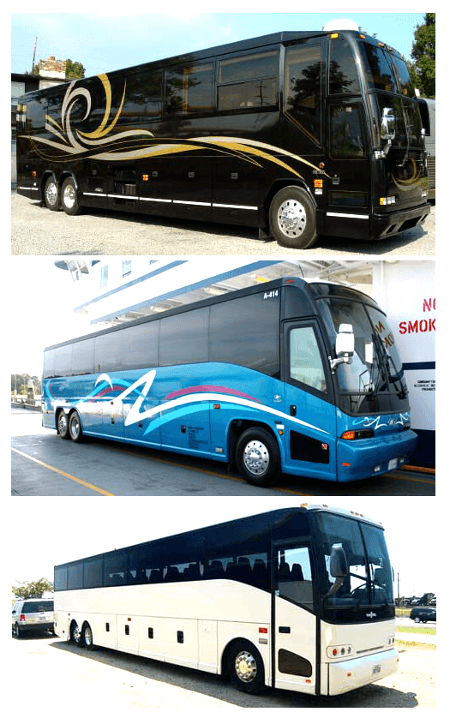 All of our charter buses are carefully selected and they are well maintained. Let our Miami Florida charter bus service transport your group! Our different charter buses are versatile and they can be used by different groups. We do have a business bus charter Miami, FL that has been designed with the features that are going to enhance your experience. Most of these charter buses have WiFi installed to keep you connected. These buses are suitable for the school trips and other school related activities. You will also come across the premium motor-coach which has been designed with a 50 passenger capacity. The charter bus Miami has been designed with state of the art equipment. Most of them come with restrooms, airplane recliner seats. For an even more luxurious experience, we are now offering limousine services in Miami. As a company, our main focus is usually customer service. We strive to provide our different customers with the best charter bus rental Miami, FL service that you need. We also ensure that the drivers are well trained when it comes to customer service. We have a website that you can use to make your reservation for the charter bus rental Miami, FL services. You need to fill the form given and confirm the details before you submit the form. Jungle Island; this is an interactive zoo with different animal species. Miami Seaquarium; it features dolphins and other sea creatures that you can explore. Zoo, Miami; this is the best place for the whole family. Coral Castle Museum; it displays different exhibitions and collections. Club Space; for the people who love to club, this is the place to be. We believe in quality and affordability and that is the reason why we offer the best bus charter Miami services to our customers. Even though we are fair when it comes to prices for our charter bus rental Miami services, we don’t compromise on the quality. Call us today for a free quote (954) 828-0219! We have great prices. We offer coverage in Miami and its environs. This means that you can use our different charter buses to access the different cities. Some of the cities that you can explore will include; Miami Beach, Gladeview, Miami Shores, Coral Gables, Hialeah, Westview, North Miami, Coral Terrace, Pinewood, South Miami. Be sure to visit charter bus Hollywood and charter bus Coral Gables.